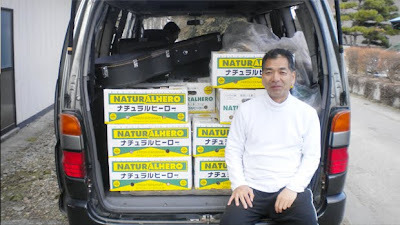 On the 3rd, the four of us with a van-load of ALL kinds of stuff, arrived at our friends'--theTadaura Family--house in Aizu, Fukushima prefecture. 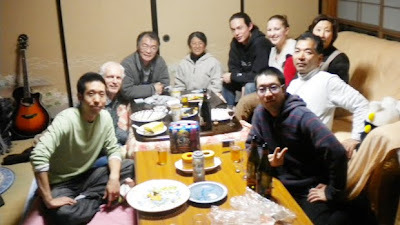 We met up with our friends, the Matsuoka family (http://inorinotomo.com) from Nasu, and Isamu Matsuoka and Yuki Kubota (http://helpeastjapan.wordpress.com) from Kashiwa, who are also up in Fukushima to visit the emergency evacuation centers. Our three vehicles loaded with people and stuff to (hopefully) give away, we left at 8:30 and managed to hit up 4 different Evacuation Sites (避難所) before 4 PM. 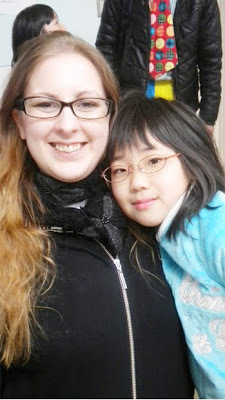 It was a lot of fun, but not a little exhausting. We were happy to get our feet wet and figure out what is just the beginning of what we hope to be able to do for these disaster victims. 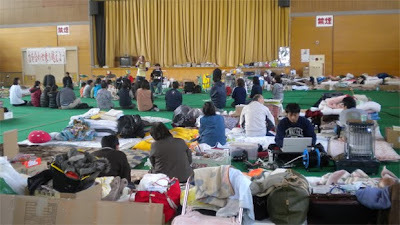 Altogether on the 4th and the 5th we were able to visit 6 evacuation sites. 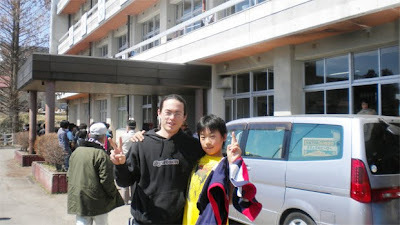 The 会津美里町おやめ荘ふれあいセンター, 高田体育館, 新鶴体育館, 会津美里町農業村環境改善センター, 赤沢小学校, and 赤沢幼稚園. 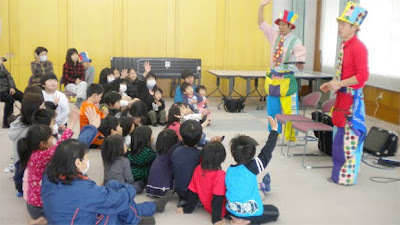 At some of these sites we were able to unload bananas, and at all of them we presented a clown and magic show (Isamu and Yuki) and mini-live by Gene and Florence. 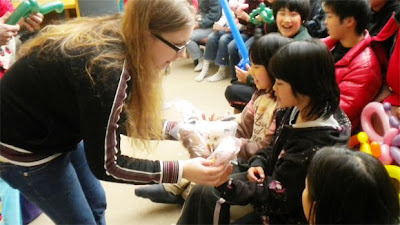 We also left each of the children with stuffed animals (donated to Family InternationalShizuoka) and balloons. 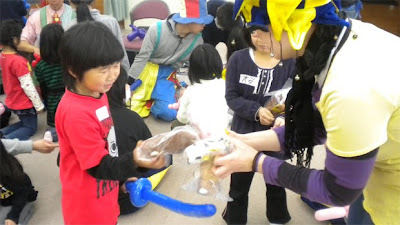 We had brand new dolls to pass out as a bit of an "encouragement gift" after our show, and mostly children came forward to receive them. One woman came up to me and asked me for a "cow doll." It seemed like a strange request, but I gave her one. Then she explained to me that her family had a cow farm in Narahamachi, and had worked for years to expand their number of cows. When they evacuated from the earthquake, they had to leave nearly 30 cows behind. They hadn't seen their cows in over 3 weeks and knew they would probably never see them again. 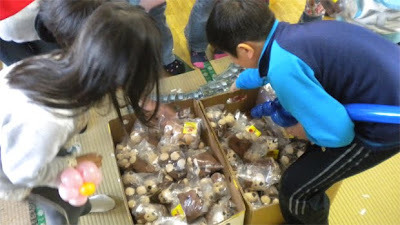 I told her she could take 30 dolls, and she said I was a funny foreigner. 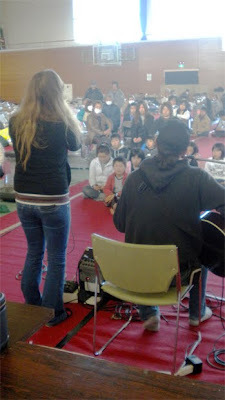 Gene and I sang mostly famous Japanese folk songs like 「花」　「涙そうそう」　「島歌」 and 「なごり雪」. We felt it like it was appropriate to honor the country and sing songs that everyone could sing along to. 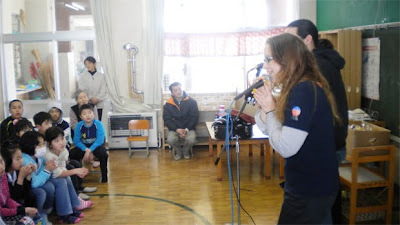 We were a little nervous about the kids, because we didn't plan a program geared toward them, but they were very polite and seemed interested in the songs that we sang. 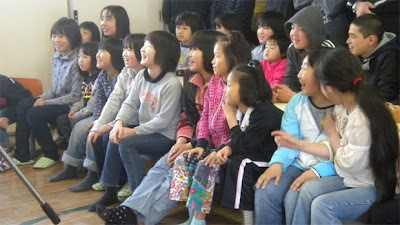 Maybe because they don't have television or much else to do, we were able to hold their interest for longer. 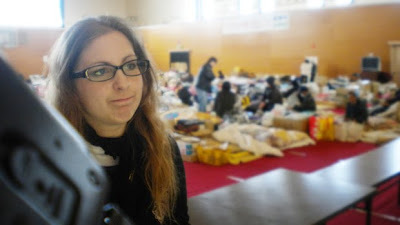 This evening we arrived in Sendai, and brought some bananas, food, and fuel for our friends here. 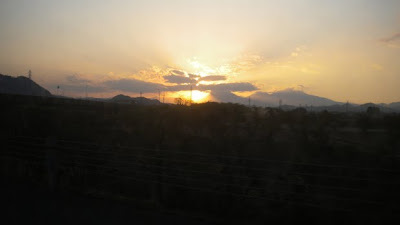 We're making plans to go to Kesennuma （気仙沼）tomorrow, so please pray for us!!! 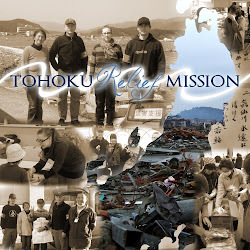 Please also pray for encouragement and strength for the evacuees, some of whom have been working non-stop in order to forget about the pain of their loss. 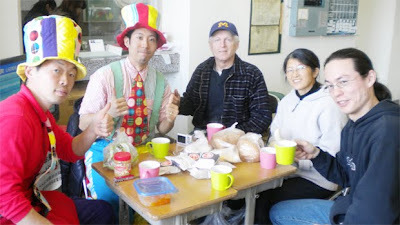 I have a new and amazing respect for these people who seem to be even more polite, kind, cheerful, and all-around JAPANESE in these, the worst of circumstances.